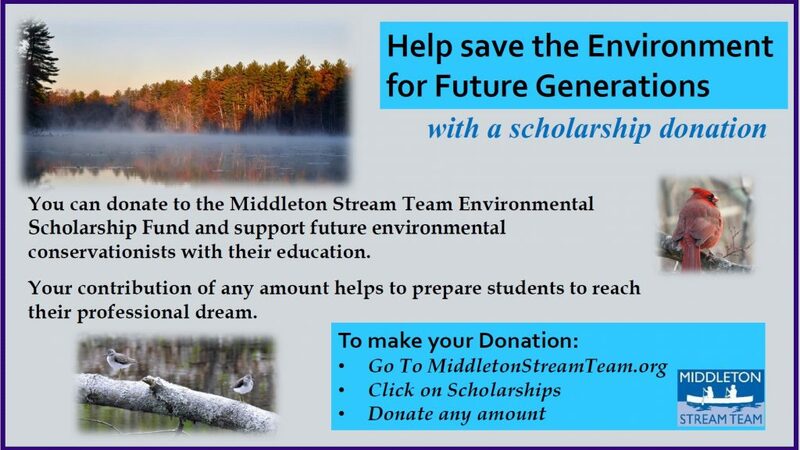 Donate to The Middleton Stream Team! We can not do this without people like you! Please understand that our programs have a completely free registration. We do ask supporters to consider making a voluntary donation. We are a not-for-profit organization and have recently applied for our 501(c)3 status. We do rely on our member’s contributions to make these programs available and to expand our offerings. In addition, we are a “grassroots” organization with very humble beginnings. Help at this time in our new organization is very important! What is the goal of the Middleton Stream Team? Our goal is to provide education, public service, conservation and advocacy. We strive to interface with local and regional environmental, community, school and youth groups; and with town government; and serve all the community! Why are our programs free? We believe so deeply in our mission and the benefits of environmentally clean communities that it is our desire to make our programs more accessible through free pricing. What is your donation used for? We run our organization on a shoestring budget utilizing the invaluable help of members, volunteers and contributions from within our community.